Although little less than a month away, preparation for the arrival of new students on campus is in full swing. Orientation planners are hard at work; construction and landscaping crews are getting facilities ready; and members of the horticultural staff in the Greenhouses are nurturing one of Wellesley’s beloved traditions. 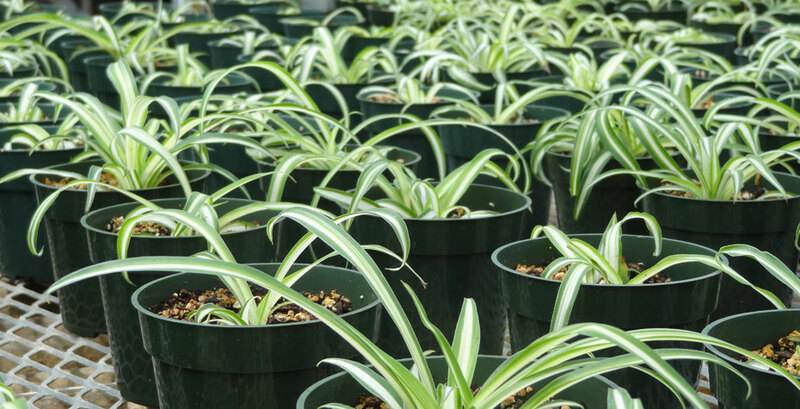 Every new student is invited to visit the Margaret C. Ferguson Greenhouses during orientation and select a houseplant of her own. The plants offered have been cultivated for easy care, and include jade plant (Crassula ovate), lucky bamboo (Dracaena sanderiana), Moses-in-the-cradle (Rhoeo spathace), pothos, or devil's ivy (Epipremnum aureum), and spider plant (Chlorophytum comosum). Some students keep their plants going for four years and then bequeath them to younger students at graduation. Some alums have decades-old plants still decorating their homes. Of course, some plants get left on the radiator and don’t last the holiday break, but they have still served multiple purposes. Not only do students get a beautiful plant with which to start enlivening their potentially bare first dorm room, the trip to the Greenhouses, adjacent to the Science Center, is a benefit in itself. The campus is big and new students may be tempted to stick close to the routes they know. The invitation to visit the Greenhouses to choose a free plant brings many students to a part of campus they might not otherwise discover for several semesters. A student who does not picture herself a “gardener” may be inclined to overlook the Greenhouses; the visit for a free plant won’t necessarily turn her into a gardener, but it will reveal to her a magical place that is always open to her. And with the journey she will begin to own the pathways all around campus.